1. On Running - I still don't feel like I'm training for a marathon. I'm not doing speed work or hills, my longest run all summer has been 6 miles and I'm certainly not talking about marathon training. My aim is to (quietly) get through the next two weeks with certain mileage planned for my long runs and for the week before I finally sound the alarm for all systems to go. I'm less than 12 weeks out and without any real training plan, the Type A in me is struggling. My number one goal right now is getting through each run without any pain. Last night, I left work and ran the mile down to the Lincoln Memorial where I met my friend Alicia for 3 miles around the Tidal Basin. When I got home, I decided to go for another mile, just to see how it felt. It felt good. I've felt really slow and out of shape this week and a time goal is the furthest thing from my mind right now. I'm just praying that sooner or later, I'll get there. The biggest issue I'm having is that post-run, my calves tighten up so badly. I'm pretty sure this is causing all of my problems. I have a hand held foam roller but it just doesn't seem to do the trick. So, who wants to buy me this? 2. On Cooking - So, I'm in a cooking rut. I love experimenting with recipes, but lately, nothing I've made has been a huge hit...especially with The Pilot. I'm starting to worry that if I don't start putting some "OMG babe, this is SO good" meals on the table soon, he may renege on his offer to marry me. When he isn't around, it's much easier, because I know what I like but it's hard to cook meals that can be both vegetarian and meat-eater friendly. I have one recipe for chicken with black bean almond pesto that I serve on rice which is perfect...I leave the chicken out for me and still get a high protein dinner...but I'm stumped on other ideas. Umm WHAT?! 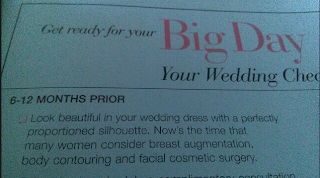 So the only way I'm going to look beautiful in my wedding dress is if I get work done? This is absolutely absurd and I was mortified that someone would actually put this as the NUMBER ONE thing to do on your wedding check list. 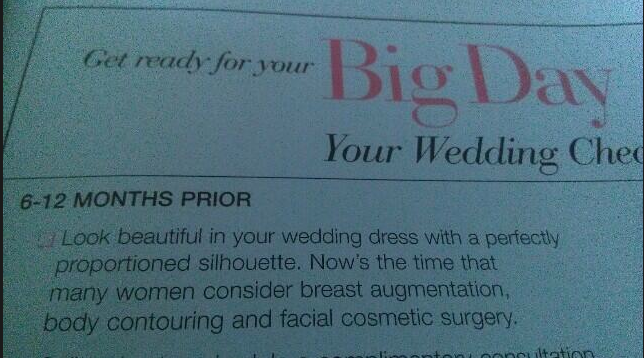 That's that guys, I've got to go schedule a consultation for some body contouring! Gross. No thank you, I'm 26. So, there you have it. Three things for Thursday. I'm so excited for the weekend! Bahahah seriously?!?! How ridiculous is that!! Whenever I am getting ready for my big day I think I'll become a bigger gym rat than I already am and just get into model shape. That is the only body reshaping this thang will ever see!! WOW. That's seriously shocking, I can't believe they would put that in a magazine! Gross. That is so awful! I don't know what you are reading it in but throw out the whole book or magazine. Awful! Better up those cans! ;). That's ridiculous. I'm glad your running has been going well lately! It will come around. Plus, most of your training will kick into high gear when this humidity (and heat) is gone, so that will make you feel faster and the whole process is easier. What in the world?? I knew people did bizarre things for their wedding, but to promote it in a magazine like it's the most important thing is crazy.